Click below and watch Dr. Deborah Frassica discuss the breadth of support services available for CMRO patients. Radiation therapy uses high energy radiation to kill cancer cells. Regardless of the technology, the goal is to always maximize dose to the tumor with extreme precision while minimizing radiation to surrounding tissue. This helps to limit side effects to healthy areas of the body. There are many different kinds of radiation treatment, and two primary ways it can be administered – externally or internally. External beam radiation uses a machine that rotates around the patient to deliver radiotherapy from virtually every angle. It aims high energy x-rays at cancer cells in the body, in small amounts per day over a period of weeks. Internal radiation uses a radioactive implant that is placed in or near the cancer. 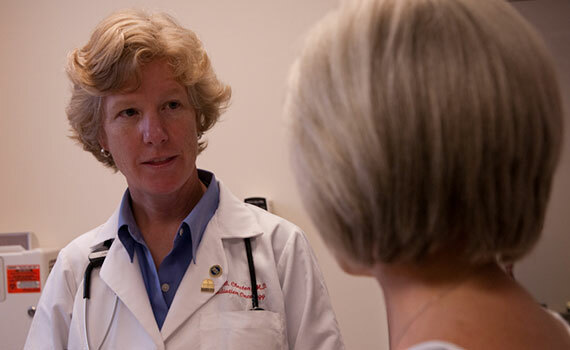 Learn more about radiation therapy’s role in cancer treatment from our medical director, Dr. Sally Cheston. Radiation therapy can be used alone or in combination with other cancer treatments for a variety of reasons, including management of single tumors or alleviation of symptoms. It is also valuable for shrinking tumors before surgery, reducing invasiveness of the surgical procedure, and treating patients after surgery to reduce the risk of recurrence. Intensity Modulated Radiation Therapy (IMRT) uses varying beam intensities to send radiation to the tumor site from the most favorable path, destroying cancer cells while minimizing damage to healthy tissue and surrounding vital organs. This type of radiation has opened the door to patients who may not have been candidates for radiation because their tumors were located near vital organs. Image-Guided Radiotherapy (IGRT) uses radiographic imaging to locate a tumor before radiation therapy treatment, which increases the accuracy of the treatment, reduces damage to healthy tissue and minimizes side effects. Stereotactic Radiosurgery (SRS) is mainly used for treating brain tumors or other neurological abnormalities, delivering focused radiation beams to a specific area to shrink or control the growth of a tumor or abnormal cells. Stereotactic Body Radiation Therapy (SBRT) delivers radiation therapy very precisely to tumors anywhere in the body. This allows higher doses of radiation to be delivered and can improve the likelihood of killing the cancer cells of a tumor. Another benefit of improved accuracy is that treatments can be completed in less time. 3-D Conformal Radiotherapy is a conventional form of radiation treatment delivery that uses a specific arrangement of X-ray beams designed to conform to the shape of the tumor to maximize tumor dose and minimize normal surrounding tissue dose. Prostate Brachytherapy involves the placement of tiny radioactive seeds in the prostate gland to target the tumor and control the area exposed to radiation. It is a minimally invasive procedure that causes fewer side effects than other treatments for prostate cancer.